As part of the POPSUGAR Insights study "Beauty Evolved: How Millennial Women Shop for Beauty and Personal Care," we asked women to tell us why they follow beauty and personal care brands on social platforms. Millennial women follow beauty brands on social platforms in order to stay informed, find deals, and take advantage of events. Overall, 42% of millennial women follow beauty brands in order to learn about new product releases, while 35% follow in order to learn about upcoming sales and promotions. Almost one in four millennial women follow brands in order to obtain advice from topic-area experts on how to use specific beauty products and 23% follow in order to hear about specific in-store events. One in five millennial women follow brands because they are fans of, or loyal to, the specific brand. 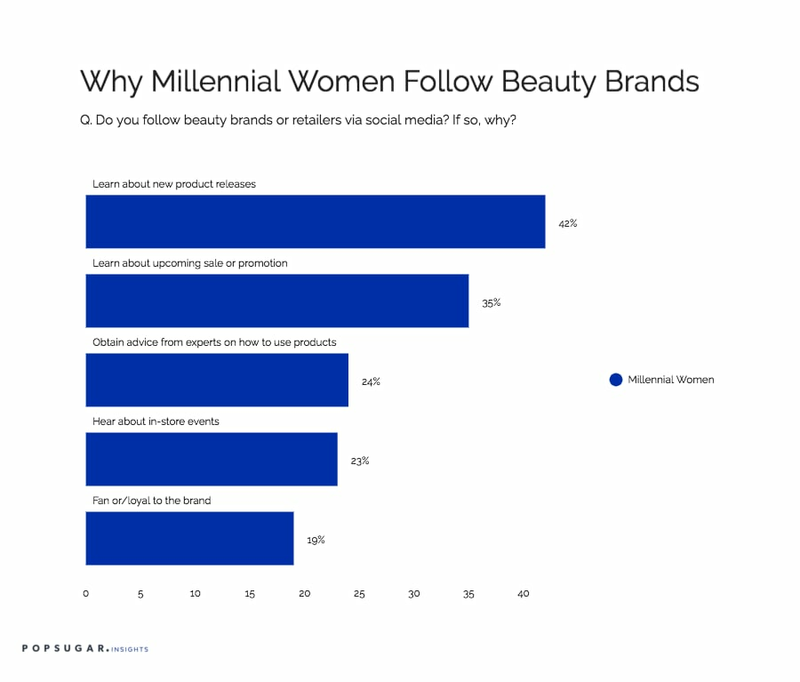 Women between the ages of 35 and 49 are more likely to say that they do not currently follow any beauty or personal care brands on social media, but among those who do, they are less likely overall to follow for the same reasons millennial women do. For example, women 35 to 49 are 33% less likely to follow brands in order to learn about new product releases and 26% less likely to follow in order to learn about upcoming sales and promotions. Beauty brands can learn from these findings about why millennial women follow beauty brands via social media and develop custom content for social that takes advantage of these popular behaviors. They can also use these platforms to test alternative types of messaging that might potentially fuel other types of behaviors, such as driving in-store local experiences.